Add Titles link with Main Menu\'s buton. Add Chapters for specific Title. Include C# 2010, C# 2005, VB, VBScript Sample source code. added create VIDEO_TS folder when output DVD image. added c# 2010 samples and fixed cannot run on 64 bit OS issue. added allow add Bitmap button on Main Menu. added allow set the chapter for specific Title. Return more information when call BuildDVDImage method. Redesign the dvd author engine. 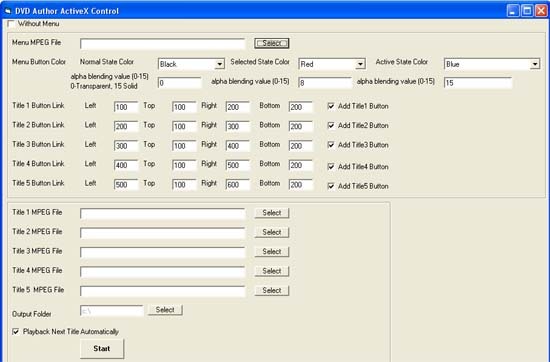 Allow change the Menu button color, include Normal state, Selected state, Active state, Alpha blending value. Support MPEG2 file with ac3 and mpeg1 audio codec. Version 2.0 fixed over 30 chapter crash problem.